← Flotilla to Scotland, anyone? Lush and Coldplay clean up their acts on “Freedom for Palestine”. Imagine logging on to your favourite site for handmade cosmetics and finding, instead of the solid shampoo bar you were looking for, an advert for a song that simply demonises Israel. This is what happened to Andrew Landeryou when he recently visited http://www.lush.co.uk and found a prominently displayed advert for Freedom for Palestine. 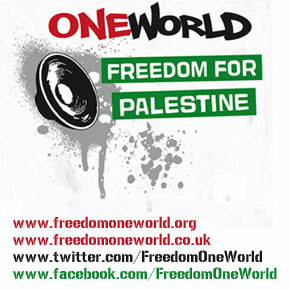 Freedom for Palestine by One World is due for release soon and accompanying the song is a video of happy-clappy-smiley people who cheerfully libel and demonise Israel. Forced from your home and your history. Gaza turned into a prison camp, apartheid wall divides the West Bank. Enough illegal occupation, violence and racial segregation, all religious communities unite. Demand Justice for all, Freedom For Palestine. We are the people, this is our time, unite together, for justice in Palestine. This is not a political song criticising Israeli policy, but a song demonising Israel and Israelis and encouraging Israel’s destruction. Anyone who knows the anti-Israel lobby will know that when they speak of “Freedom for Palestine” they are really talking about Palestine replacing Israel. Meanwhile, the mention of “six million (palestinian) refugees” seems to be a sick comparison to the six million Jewish dead in The Holocaust. It is sheer depravity to compare the lives of the Palestinians to those of Jews shoved into Nazi gas chambers. Also, in the video (below) we see a cartoon of an Israeli soldier knocking to the floor a Palestinian woman while she is holding her baby. The use of cartoon imagery points to a total absence of footage of this actual occurrence. Even the “deeply religious” Neturei Karta make an appearance in the video. Such “Freedom For Palestine” would entail bloodshed on a massive scale as no Jew would willingly give up their country to thousands of so-called “refugees” who have never lived there and a country which, in its short 63 years, has been so successful and contributed so much to the world in the fields of, inter alia, science and technology. The only Jewish state would become yet another Muslim state. In the same 63 years surrounding Arab countries have languished in economic despair, trying to use Israel as a diversion tactic. And when that hasn’t worked, they have massacred their own people as a last resort; Syria being a prime example. 20,000 Syrians were murdered by President Assad in Hama in 1982 and since March another 1,300 Syrians have been murdered by his son, Bashar. The lyrics referring to “religious segregation” and “apartheid” are pure pernicious propaganda as is the line “We’ll break down the wall”. This wall has stopped many Hamas suicide bombers from getting into Israeli cafes and discos and onto Israeli buses. Israel needs to make no apologies for this. But the people in the video obviously don’t care about Israeli civilians being murdered and maimed en masse. The good news is that Coldplay and Lush have now removed adverts for the song from their sites (although Vicky Jansson at Lush still thinks their campaign to demonise Israel is live). It is a shame that itunes and HMV are selling a song that merely intends to spread hatred of the Jewish state and the Israeli people. Hopefully, the single will die a slow death and the writers, musicians and performers associated with the song will become tarnished goods; a fate they will have definitely deserved. This entry was posted in anti-Semitism, Holocaust, Israel, UK and tagged Assad, Coldplay, Freedom for Palestine, gaza, Israel, Lush, neturei karta, One World, palestine, syria, the Holocaust. Bookmark the permalink. Can I suggest that as many people as possible flag this on YouTube’ . Once they receive X amount of complaints they will take it down. It is also on one of the Australian pro-Palestinian web sites, that’s where I got the link from. IT’s under the One World button on the site. The campaign/charities person SOPHIE PRITCHARD, does not care that the campaign is full of lies, or that Israel LEFT Gaza in 2005, or that this campaignb is not aboiut “both sides” but only about pushing for Palestine. Neither she nor the 2 staffers I spoke to have read the Hamas Covenant. SP was approached by War on Want to run this campaign, and because they “respect the people behind the campaign” she went with it. THis despite the number of pro Pali groups, and the fact that War On Want has been investigated by the UK Charity Commission. it will be available on iTunes only as of July3, 2011 the single only availabe with the whole album which costs 3,99 – doesn’t sound like much of a band but the music seems to have good hopping around appeal. As of now iTunes doesn’t allow comments. Meanwhile, the mention of “six million (palestinian) [sic] refugees” seems to be a sick comparison to the six million Jewish dead in The Holocaust. It is sheer depravity to compare the lives of the Palestinians to those of Jews shoved into Nazi gas chambers. This is so typical of Zionist paranoia. In the first sentence note the cautious use of ‘seems’. In the next the lyricist is point-blank accused of comparing ‘the lives of the Palestinians to those of Jews shoved into Nazi gas chambers’. Yet nowhere does he/she do that, other than in Millett’s overheated imagination. You should be deeply ashamed of yourself, putting words into someone’s mouth like that. Oh, just crawl back under your stone, you disgusting creature. Gretchen, you belittle apartheid and there shouldn’t be any “Palestinian refugees” but they are kept as pawns in poor conditions so people like you can point at them and say “look, those poor refugees”, when really they are being treated dreadfully by their Arab brothers and by people like you who keep them in these camps. The song itself belittles the Holocaust, because there are not over 6m refugees anyway, but, as Silke has pointed out, the UN itself claims there are 4.5m. The song is just full of lies, but buy it if you want. You won’t change the plight of the Palestinians if you do. Although I can’t find a link to it from elsewhere in the site anymore. UPDATE: We had a great reaction to this story, with literally hundreds of people emailing, text-ing and phoning about their outrage at Lush and we assume that was just a proportion of those who made contact with the company. We spoke. They listened and while they’re keeping their reasons to themselves, they’ve moved the offending promotion from their front page and it’s no longer accessible from their campaigns page. Good riddance to bad rubbish. Do you recall where it came from on the site please ? Daniel I am full of admiration for you, but already yesterday I feared that this would wake up the Zombie. I have to tell you that if the author of this excellent blog is paranoid, then before reading your thoughtful piece, I was suffering from the same condition myself. The moment I read the line “more than six million refugees” I wanted to comment, but Richard had beaten me to it. Then again, as you say, perhaps no reference to the Holocaust was intended. Perhaps from all possible numbers the lyricist just happened to choose 6,000,000, why not? It’s a minute chance (one in six million), but what the hell, why be paranoid? So assuming the choice of 6,000,000 was some wild random fluke, the next question would have to be whether the song’s writer understood the significance of that number to the Jewish People, and if he didn’t, did nobody point it out to him. Again you may be right. Maybe the lyricist had haphazardly dreamed up this, most significant of all numbers of Jewish history, and neither he nor any person involved in the production of the clip had ever read a history book. After all, aren’t we being a touch paranoid here? Maybe there were six million Jewish victims of the Nazi Holocaust but now that the Jews have caused “MORE than six million” to become victims, not only has the slate truly been wiped clean, but the Nazis’ victims are supposedly worse they ever were. However, on reading your comment I realize that it was just the old Jewish paranoia kicking in again. But then, on the other hand who was it that said, “Just because you’re paranoid, it doesn’t mean that they aren’t out to get you.”? After all Gert my old friend, even paranoids have enemies and haters – I suspect that we may have just heard one sing. the last time I looked even UNRWA with its admittedly here and there and elsewhere shaky record keeping record claimed “only” 4.6 – but that would have meant a hard choice for the lyricist: upgrade to 5 like in the future will be here soon or downgrade to 4 which would be so unjust to all those who frauded their way into the system, preferring it to trusting on the charity of their Arab brethren who according to what they tell me from their “holy” book are very very keen on dispensing charity right and left. Furthermore I think six with its clearly marked sound at the end makes itself better heard. Of course anybody with a claim to being really an artist would overcome that stumbling block and use it to his advantage. Common Rich the song is nowhere near as bad as stuff you have previously highlighted. There are refugees from Israeli actions in previous wars – if the number is wrong then say so (of course the singer will try to make the comparison – it is his most effective way of getting attention) – am I right in thinking Palestinian diaspora numbers more than 6 million now? The displacement of six million people (if that is correct) and no doubt many avoidable deaths in refugee camps is a noteworthy issue. Where does it call for Israel’s destruction? I have no doubt the singer wants a different end balance to what you, and even I, want but that does not mean destruction. Around a million Jews were forced out of Arab/Muslim lands. Where is the sympathy you feign ? I am saying here, don’t believe me, also don’t believe the propaganda you’ve been fed. It is well documented by Jews and Arabs alike. Abbas himself has said his family were not forced to leave. The definition of a refugee is —a person who has been forced to leave their home and seek refuge elsewhere. Seeing as to how these people were not forced, they are not refugees. A refugee also only applies to the first generation of people who fled. Not 3 or 4 down the track. there are in reality about 40,000 to 60,000 Palestinian refugees. What is a “refugee”? Usually someone who has been moved from his or her land. 90% of Palestinians have not been moved but are living where they were born. As for the Palestinian diaspora, everyone of which is termed a “refugee” even if they are a top banker in New York or London, who knows what the number is. But as Daniel says above, 6,000,000 is a suspicious number to focus on. I have heard estimates of anything from 6,000,000 to 9,000,000. But I know this anti-Israel movement very well. The people in the video, three of whom i recognise, all want Israel’s destruction. They are known for it. There is no “racial segregation” or “apartheid” going on either. The song is just lies. I’m glad Coldplay got cold feet. The distortions and manipulative, inaccurate use of the ‘six million’ figure show this song to be yet another self-indulgent, dishonest bit of propaganda. The people in the video, three of whom i recognise, all want Israel’s destruction. They are known for it. Richard, I recognise Michael Rosen and Mark Thomas, and I assume the guy in a wheelchair is Jody MacIntyre. I have been trying to identify the rest of the line up- Whom do you or anyone else here recognise? Yes, it is Jody. Lowkey is there also. Plus Naturei Karta. Don’t worry amie, It wil take more than an overweight guy with a hat to destroy Israel. I obediently flagged the song as instructed, but if it had been my choice I’d say, “Let them sing!” It’s not really doing anyone that much harm and the lady dances quite decently. Though I know that the lyrics are a pack of lies, as a child I used to sing about “Bill and Ben” and “Andy Pandy” and I’m pretty sure that they have little basis in historical fact either. I know that it’s not the same, but I think we should allow anti-Semites a certain amount of artistic license to express their frustrations too. Daniel Marks, excellent rebuke to Gertie. No rebuke was intended I assure you – there is nobody on this excellent blog who respects Gert and sympathizes with his plight more than I do. When I spoke about our opponents’ frustrations, I made use of understatement. These are not easy days for those who for decades have supported crack-pot authoritarian regimes while complaining of Israeli “brutality”, only to find their comrades in arms machine gunning each other to death across the region. Yes, we have our problems too, I shall not deny. For those of you who have not heard the price of cottage cheese has recently increased and Israeli consumers are rebelling against the companies that manufacture it by organizing a consumer boycott of cottage. On the other hand, a few kilometers away from our dairy rebellion the streets of Syria are littered with bloody corpses of innocent civilians shot indiscriminately by Assad’s henchmen. There are bodies of decent Syrian soldiers too, who refused to murder random men, and children – and were shot in the back by their officers. May the families of these unfortunates be forever proud of their sons. The Middle East is as volatile today as it has ever been, and not one Arab here truly enjoys the blessings of democracy or freedom or basic human rights, with the exception of those lucky enough to enjoy Israeli citizenship. Our Arabs aren’t going anywhere and they know exactly why. which reminds me, that George Orwell tells that he had a teacher who asked his class each morning: “what is the most important thing in the world?”*) and the class hat to answer in chorus FOOD. I’ve been checking that again and again against my real life experiences which is a bit hard to do since I live in such an affluent society but I think it is true. With us most food price raises are so minimal (one step at a time) that they fly under the radar, but when two years or so ago they raised the price of butter noticeably there was an uproar, they cut it down again only to raise them back to pre-outroar height. The second time around the public staid quiet since what we call discounters continue to provide cheap butter which is good enough for cooking but if you like it just spread on a piece of rye bread with some salt sprinkled over it with possibly a soft boiled egg to accompany it then it has to be the by now ridiculously expensive Irish one. Feh, who needs Lush anyway? Better to buy Ahava. That song is truly awful. Better off downloading some good Israeli music of which there is plenty. Truth be told, food prices in Israel on the whole are quite cheap and cottage cheese has become more of a symbol than anything else. The same folk that are trying to bring down the government over cottage are buying fresh chicken for three Shekels a kilo. I think that most people fill up their shopping trolley with the money earned with two to three hours work and are covered for three or four days. I’ve just returned from a scrumptious late breakfast out with at aroma Rachelle and scrupulously adhered to the boycott with a mixture of salads and cheese that didn’t include cottage. Hot chocolate was to die for. Now I must cook for Shabbat. A settler’s work is never done. PS It’s Friday, the day our partners for peace usuall kill each other after prayers. Good luck to them all! you have that on choice for breakfast? Let’s hope your partners in peace get so interested in eachother that none find the time to further violate the lull – may the people of Sderot a Sabbath without the sound of the siren.